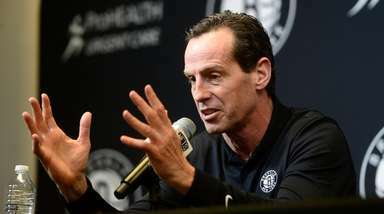 The Los Angeles Rams defeated the New Orleans Saints, 26-23, in the NFC Championship Game on Sunday at the Mercedes-Benz Superdome in New Orelans. 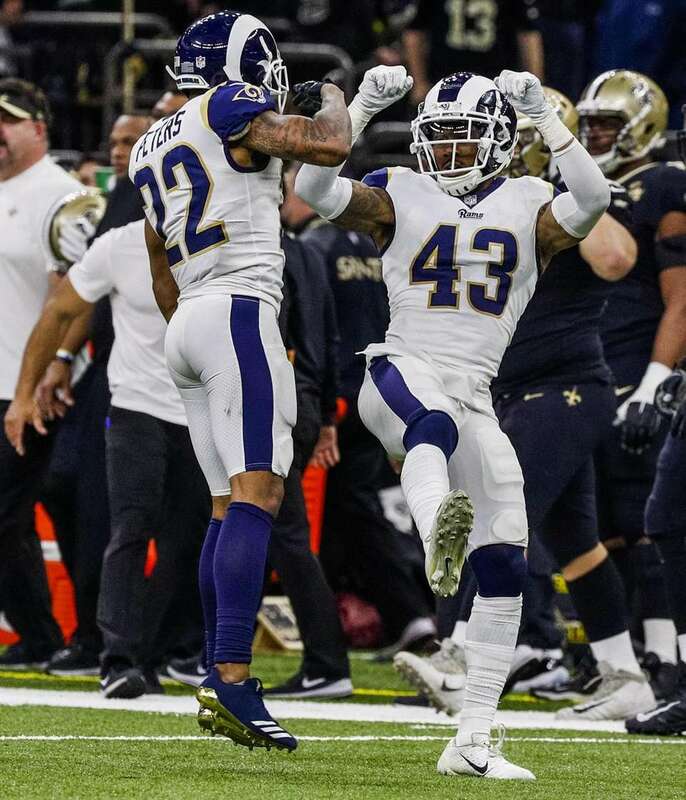 Los Angeles Rams strong safety John Johnson (R) celebrates with Los Angeles Rams cornerback Marcus Peters (L) after intercepting a pass against the New Orleans Saints in overtime during the NFC Championship game in the Mercedes-Benz Superdome in New Orleans, Louisiana, USA, 20 January 2019. 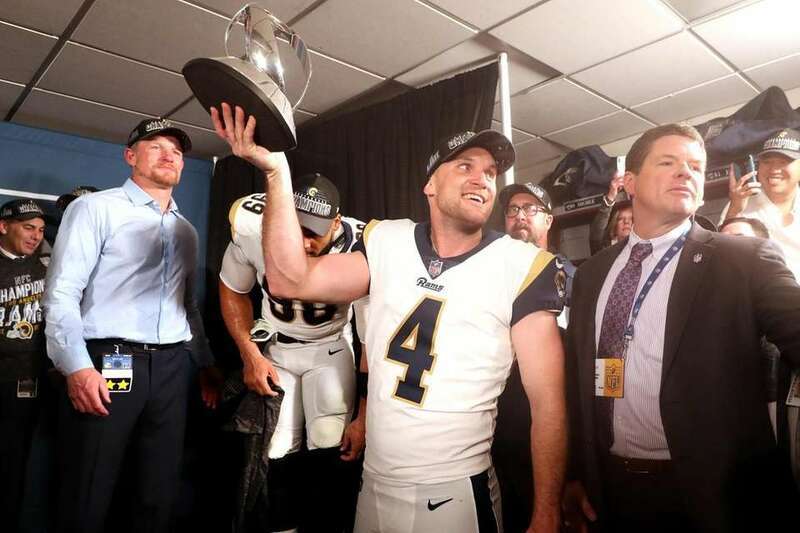 Greg Zuerlein #4 of the Los Angeles Rams celebrates with the NFC Trophy after defeating the New Orleans Saints in the NFC Championship game at the Mercedes-Benz Superdome on January 20, 2019 in New Orleans, Louisiana. 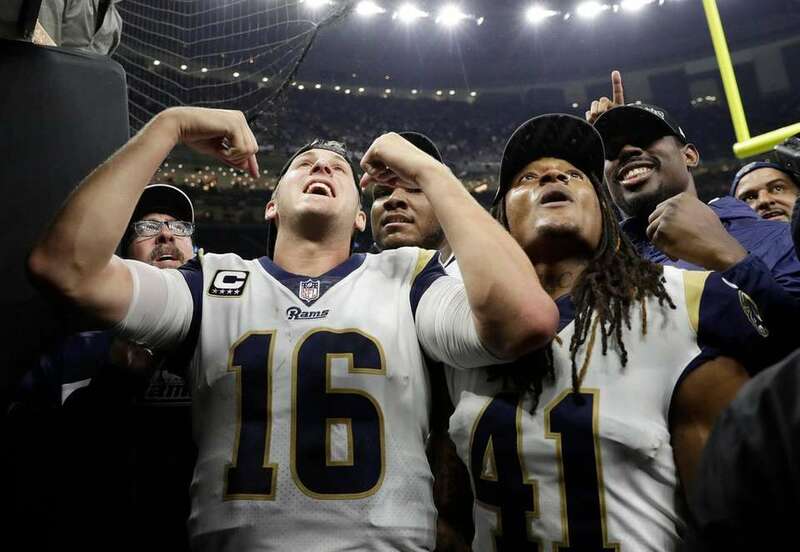 Los Angeles Rams quarterback Jared Goff (16) and Los Angeles Rams defensive back Marqui Christian leave the field after overtime of the NFL football NFC championship game against the New Orleans Saints, Sunday, Jan. 20, 2019, in New Orleans. The Rams won 26-23. 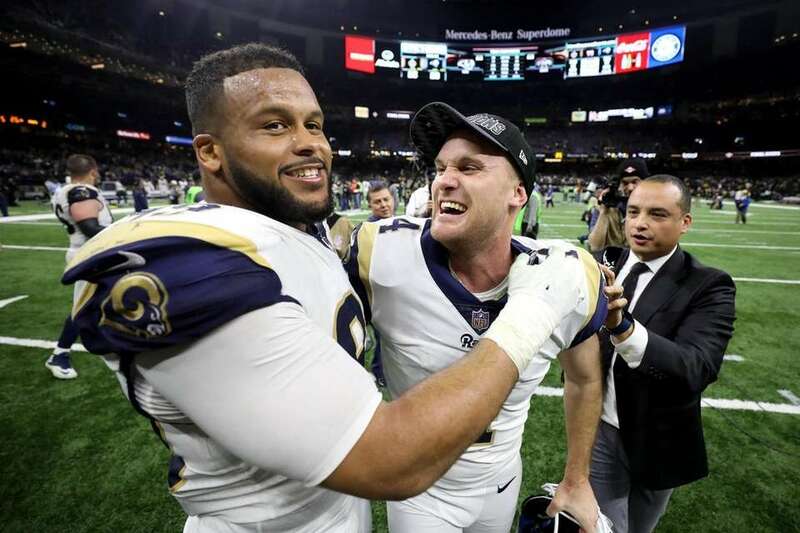 Aaron Donald #93 and Greg Zuerlein #4 of the Los Angeles Rams celebrate after defeating the New Orleans Saints in the NFC Championship game at the Mercedes-Benz Superdome on January 20, 2019 in New Orleans, Louisiana. 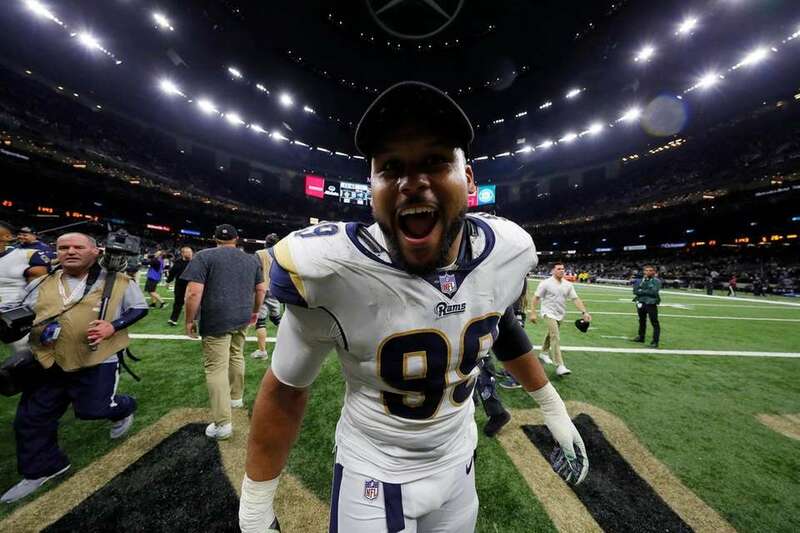 Aaron Donald #99 of the Los Angeles Rams celebrates after defeating the New Orleans Saints in the NFC Championship game at the Mercedes-Benz Superdome on January 20, 2019 in New Orleans, Louisiana. 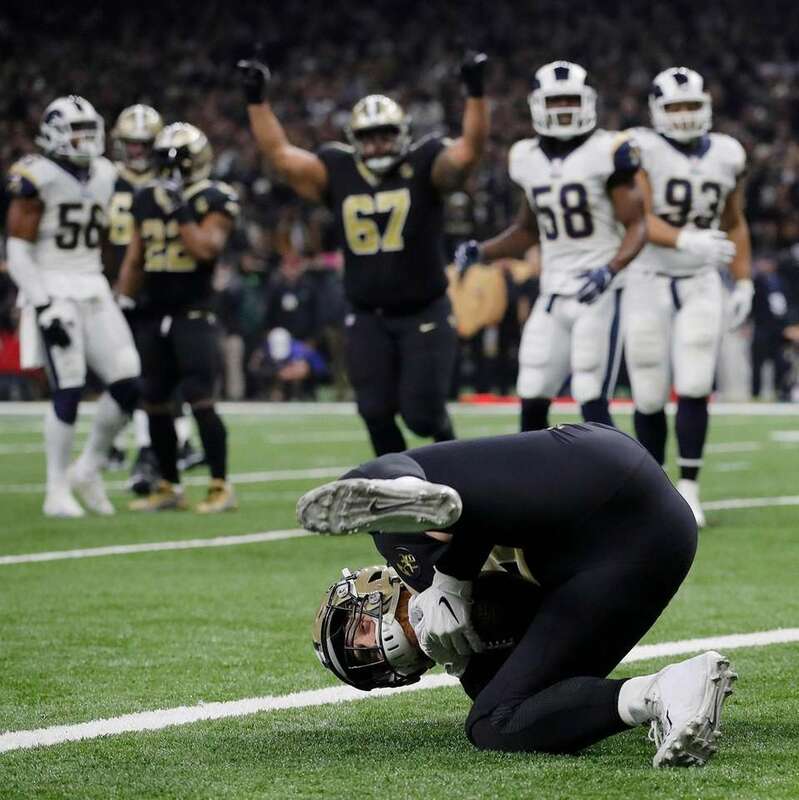 Los Angeles Rams kicker Greg Zuerlein watches as his game winning field goal splits the goal post uprights in overtime of the NFC Championship game in the Mercedes-Benz Superdome in New Orleans, Louisiana, USA, 20 January 2019. 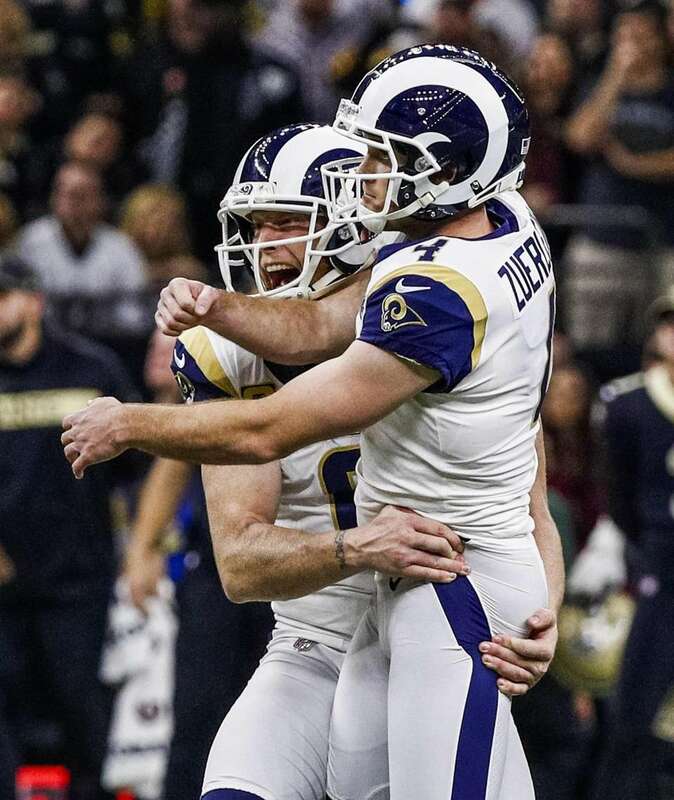 Los Angeles Rams kicker Greg Zuerlein (R) celebrates with Los Angeles Rams holder Johnny Hekker (L) after kicking the game winning field goal to defeat the New Orleans Saints in overtime of the NFC Championship game in the Mercedes-Benz Superdome in New Orleans, Louisiana, USA, 20 January 2019. 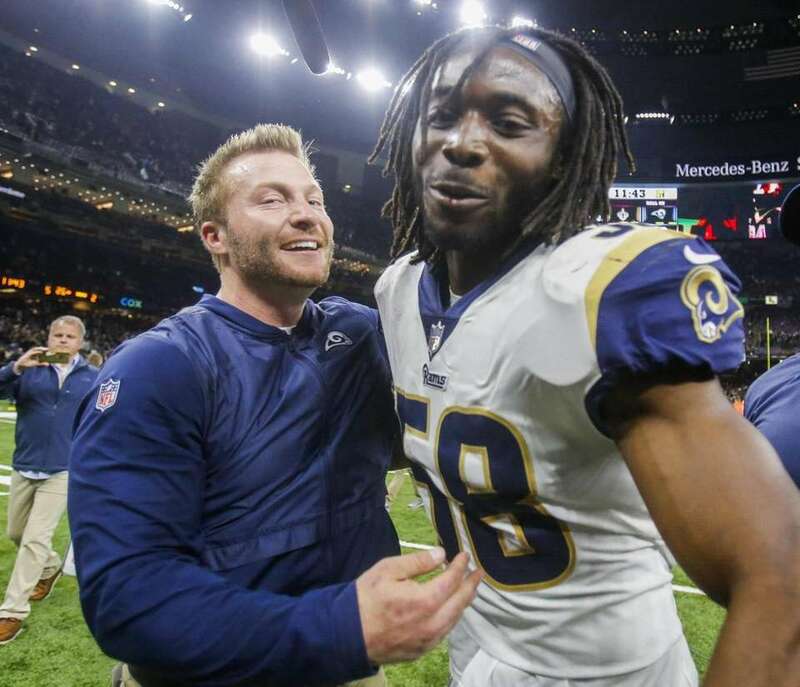 Los Angeles Rams head coach Sean McVay (L) celebrates with Los Angeles Rams inside linebacker Cory Littleton (R) after the Rams defeated the New Orleans Saints in the NFC Championship game in the Mercedes-Benz Superdome in New Orleans, Louisiana, USA, 20 January 2019. 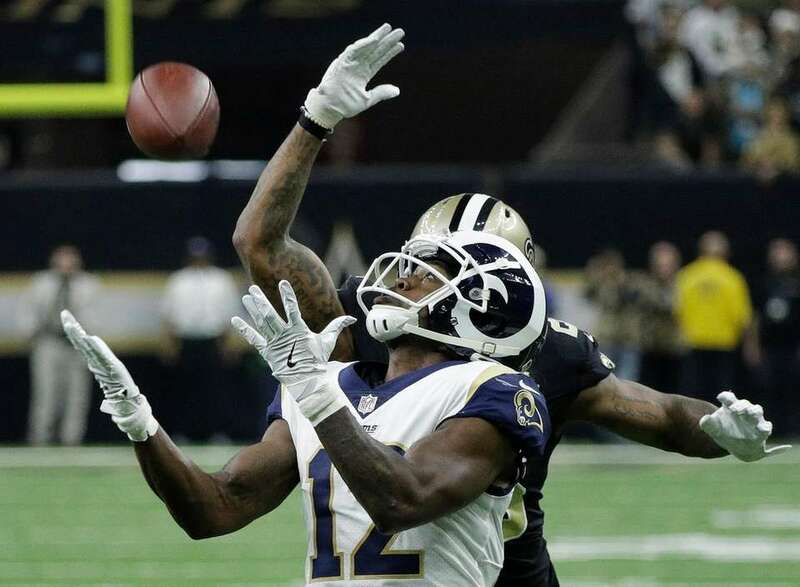 New Orleans Saints wide receiver Ted Ginn (R) catches a pass as Los Angeles Rams free safety Lamarcus Joyner (L) defends during the NFC Championship game in the Mercedes-Benz Superdome in New Orleans, Louisiana, USA, 20 January 2019. 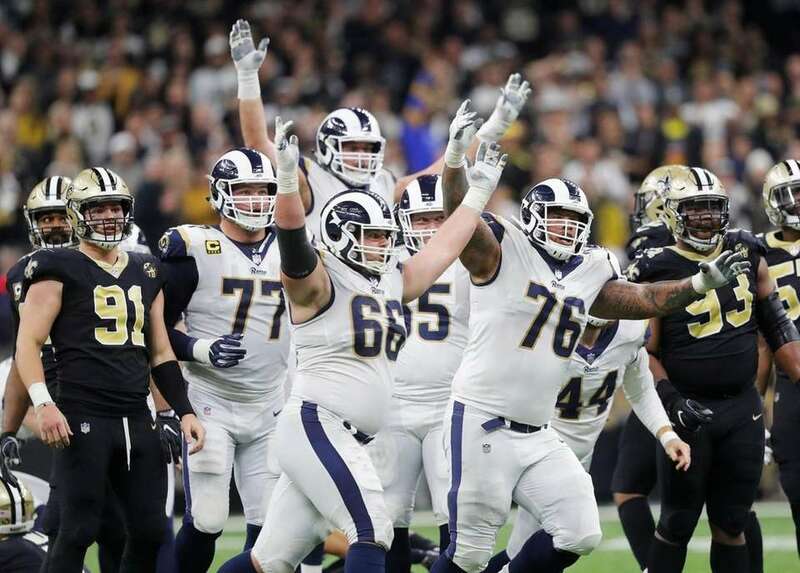 Los Angeles Rams players celebrate after overtime of the NFL football NFC championship game against the New Orleans Saints, Sunday, Jan. 20, 2019, in New Orleans. 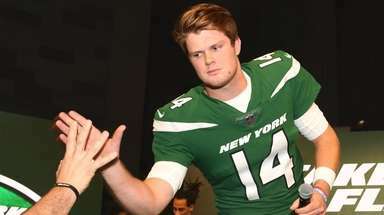 The Rams won 26-23. 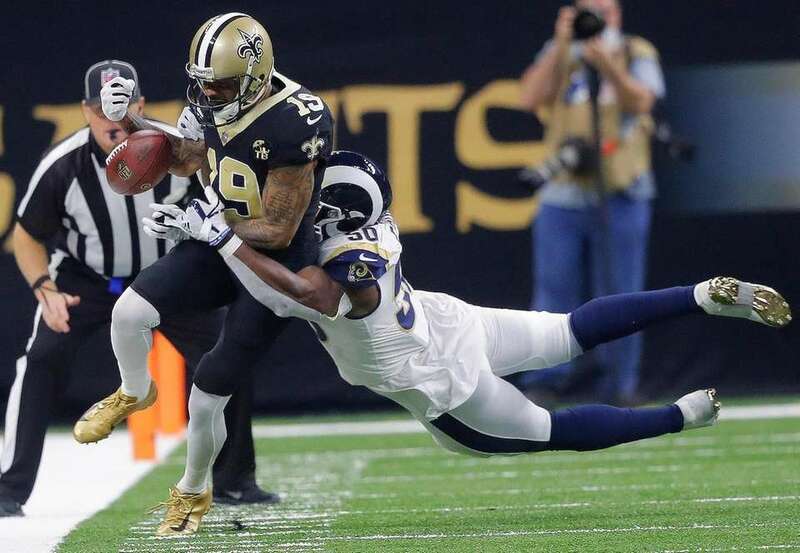 New Orleans Saints' Ted Ginn is stopped by Los Angeles Rams' Todd Gurley during the first half of the NFL football NFC championship game, Sunday, Jan. 20, 2019, in New Orleans. 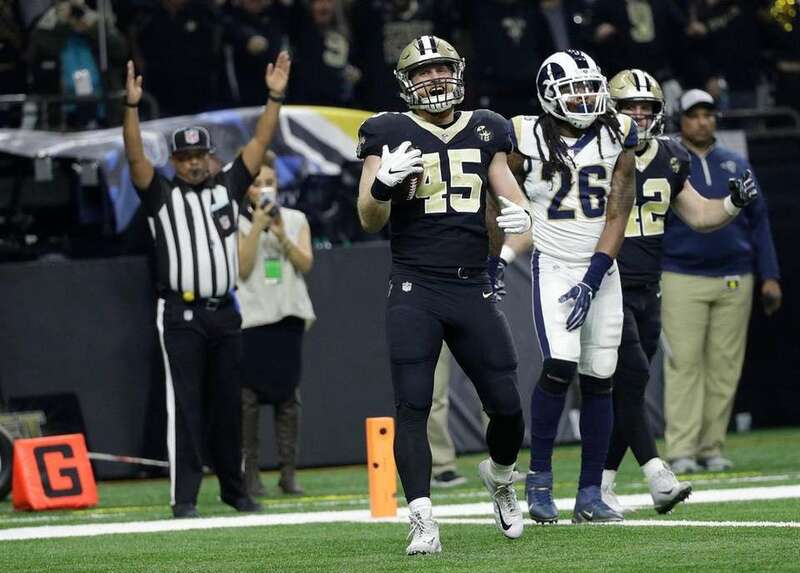 New Orleans Saints' Garrett Griffin catches a touchdown pass during the first half of the NFL football NFC championship game against the Los Angeles Rams, Sunday, Jan. 20, 2019, in New Orleans. 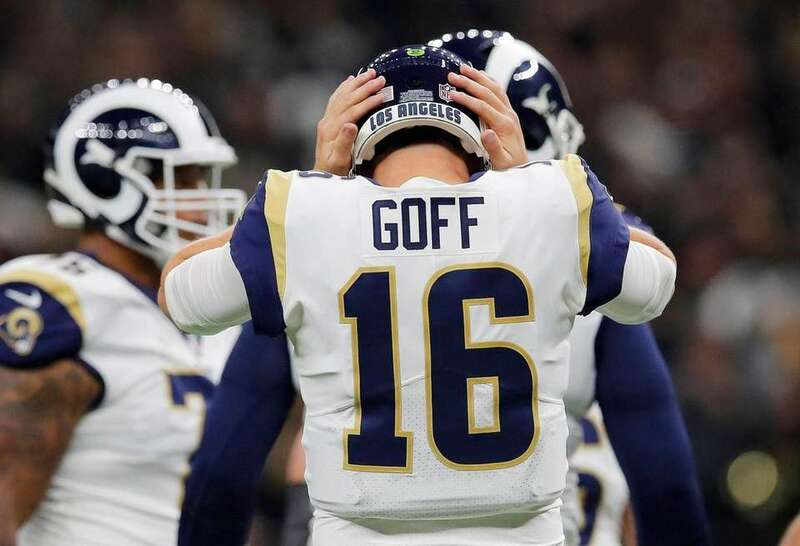 Los Angeles Rams' Jared Goff struggles to hear during the first half of the NFL football NFC championship game against the New Orleans Saints, Sunday, Jan. 20, 2019, in New Orleans. 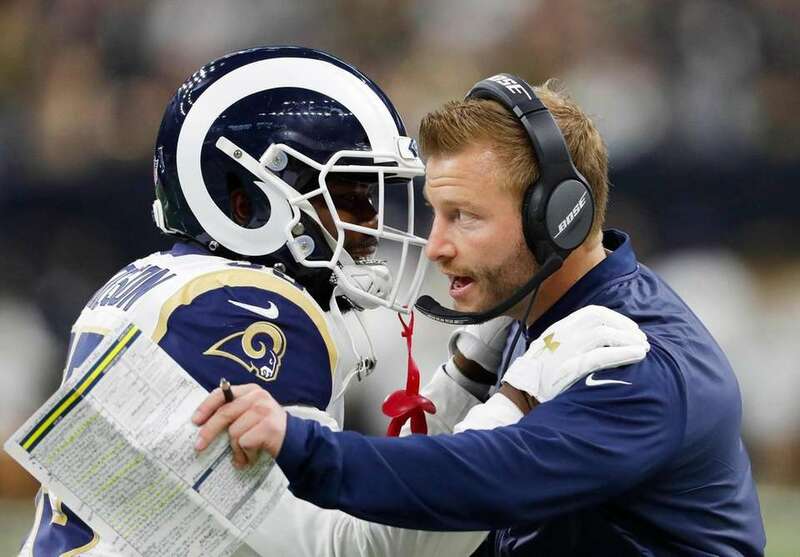 Los Angeles Rams head coach Sean McVay speaks with C.J. 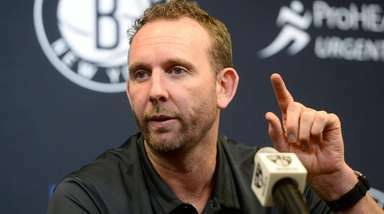 Anderson during the first half of the NFL football NFC championship game against the New Orleans Saints, Sunday, Jan. 20, 2019, in New Orleans. 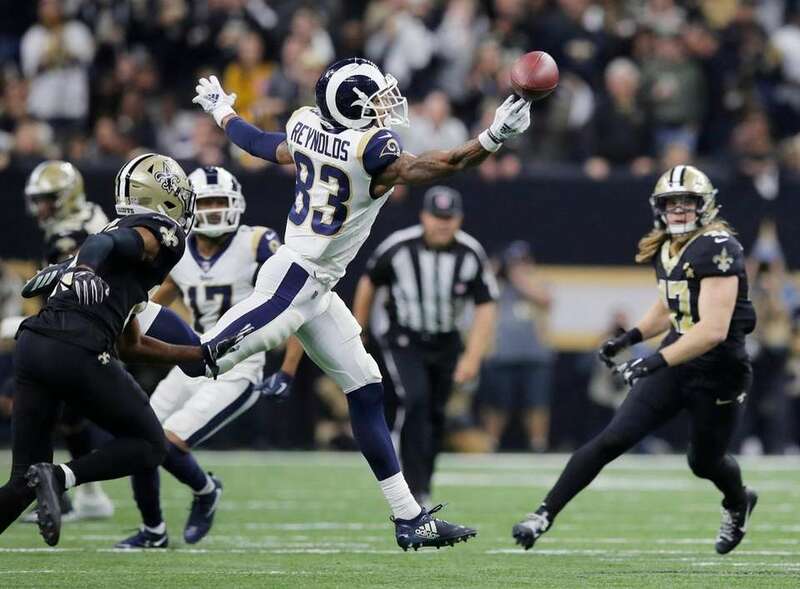 Los Angeles Rams' Josh Reynolds can't catch a pass during the first half of the NFL football NFC championship game against the New Orleans Saints, Sunday, Jan. 20, 2019, in New Orleans. 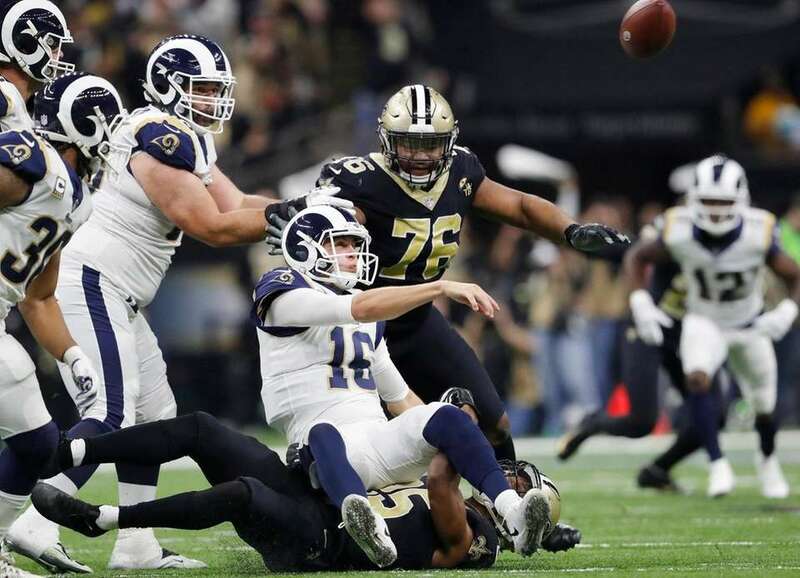 Los Angeles Rams' Jared Goff throws as he is taken down during the first half of the NFL football NFC championship game against the New Orleans Saints, Sunday, Jan. 20, 2019, in New Orleans. 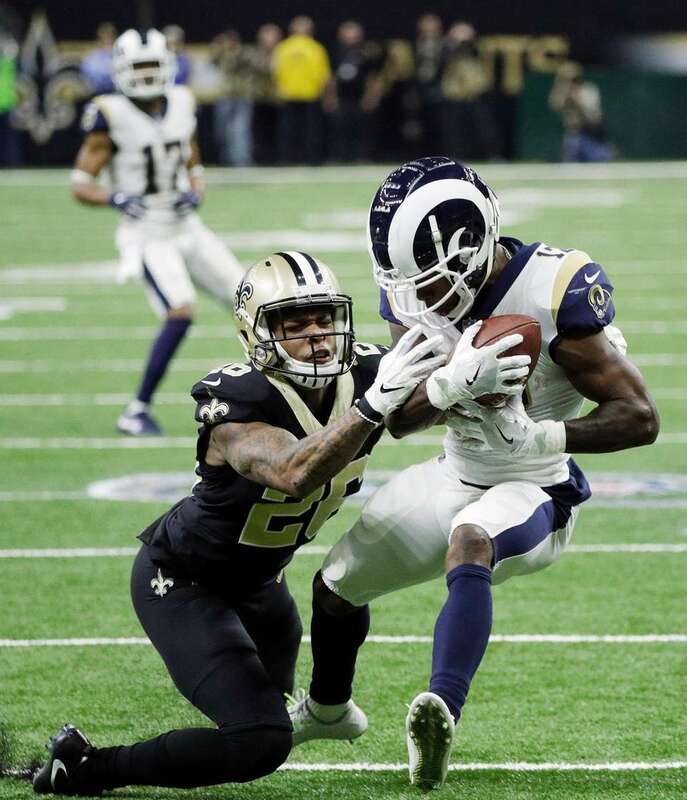 Los Angeles Rams' JoJo Natson tries to get past New Orleans Saints' Vonn Bell during the first half the NFL football NFC championship game Sunday, Jan. 20, 2019, in New Orleans. 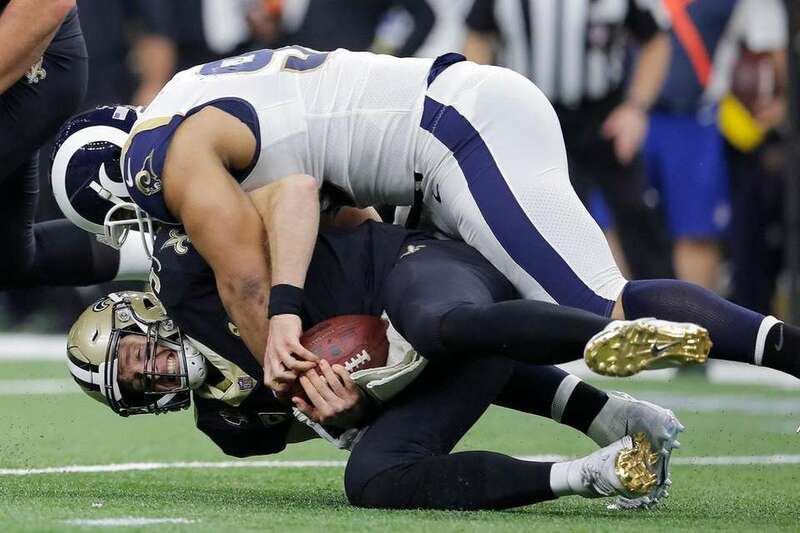 New Orleans Saints' Drew Brees is sacked by Los Angeles Rams' Ndamukong Suh during the first half of the NFL football NFC championship game, Sunday, Jan. 20, 2019, in New Orleans. 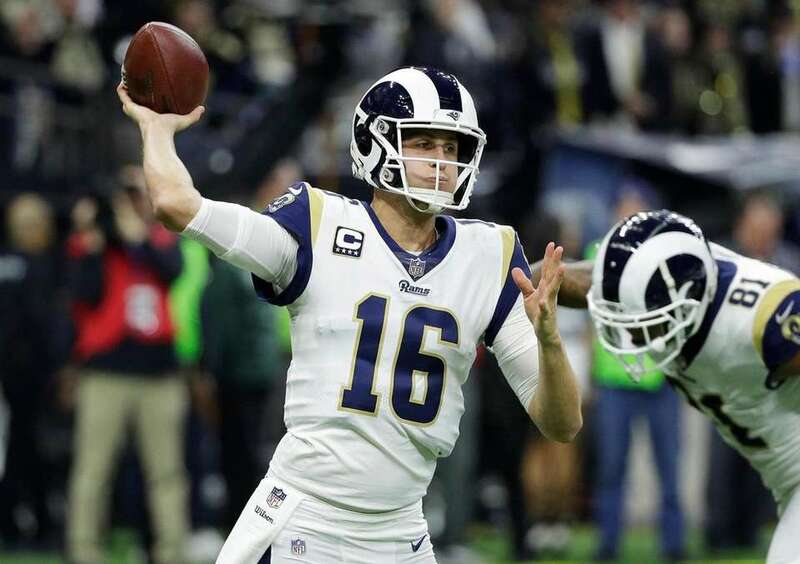 Los Angeles Rams' Jared Goff throws during the first half of the NFL football NFC championship game against the New Orleans Saints, Sunday, Jan. 20, 2019, in New Orleans. 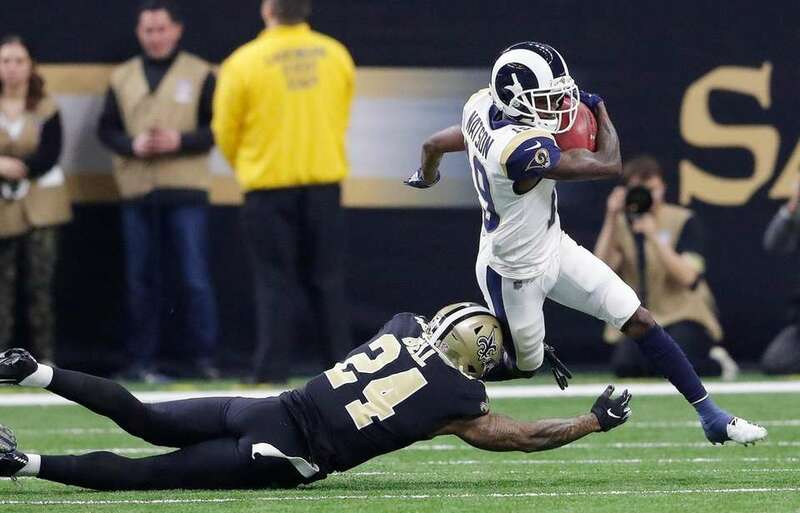 Los Angeles Rams' Todd Gurley dives into the end zone for a touchdown during the first half the NFL football NFC championship game against the New Orleans Saints, Sunday, Jan. 20, 2019, in New Orleans. 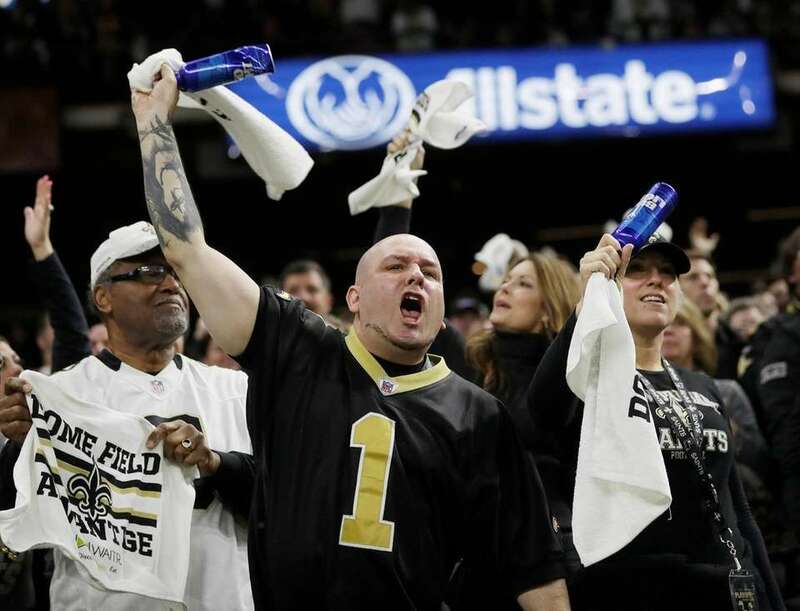 Fans cheer during the first half the NFL football NFC championship game, between the New Orleans Saints and the Los Angeles Rams, Sunday, Jan. 20, 2019, in New Orleans. 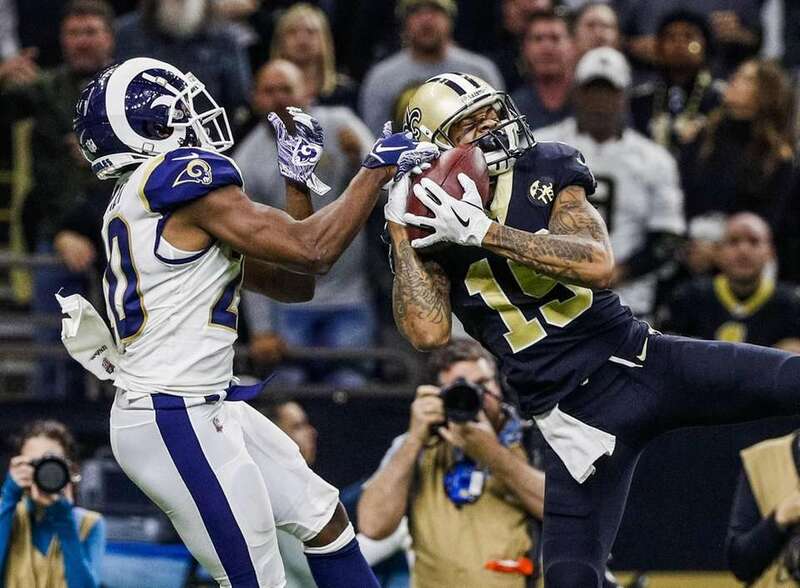 Los Angeles Rams' Brandin Cooks catches a pass in front of New Orleans Saints' P.J. 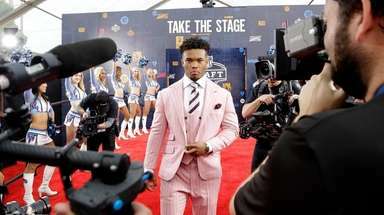 Williams during the first half the NFL football NFC championship game, Sunday, Jan. 20, 2019, in New Orleans. 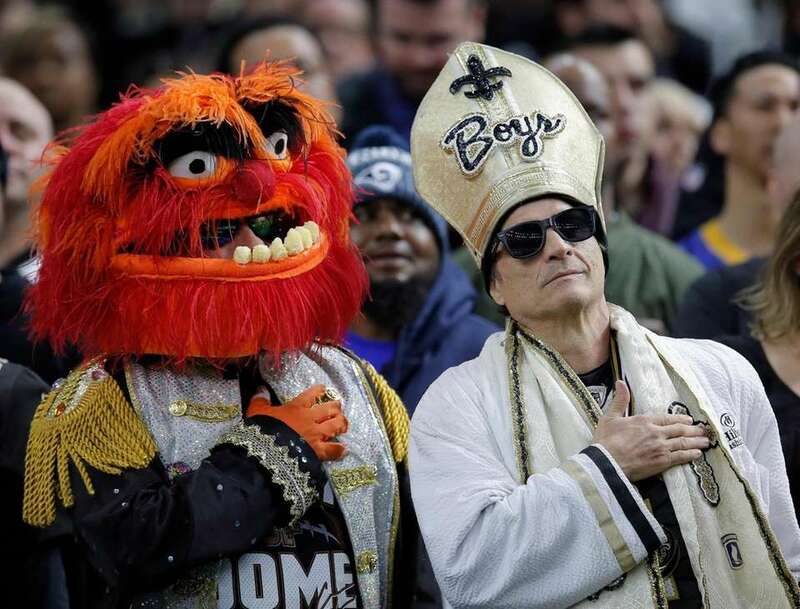 Fans sing the national anthem before the NFL football NFC championship game between the New Orleans Saints and the Los Angeles Rams, Sunday, Jan. 20, 2019, in New Orleans.